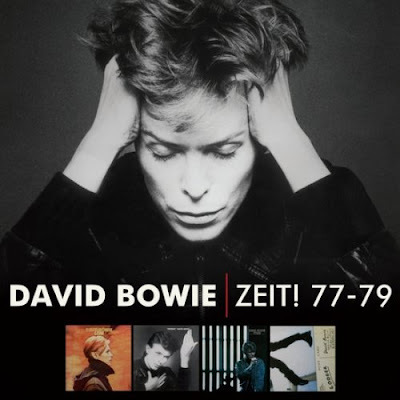 After David Bowie's big comeback with 'The Next Day', EMI Records has announced a repackaging the existing versions of the Low (1977), “Heroes” (1977), Stage (1978) and Lodger (1979) CDs together in a cardboard slipcase, under the box set name of 'DAVID BOWIE – ZEIT! 77-79'. The three studio albums here were released between 1977 and 1979 and are generally referred to as the somewhat misleading Berlin Trilogy. A more unifying theme throughout the three recordings is the presence of Mr Bowie, Mr Eno and Mr Visconti.